These three words, "How much more?" might as well be the mantra for most people these days. It seems that every week we think we've come to the point of All We Can Handle and we are given yet more, and somehow become stronger and more resilient in the process of navigating what is offered with grace and humility. I love the phrase MacKenzie chose. What a powerful reminder that in our brokenness there is always unconditional love. These three words are important to me, as they represent something bigger than myself; God's infinite love. If we are able to love and take care of each other as fallible and broken humans, with our short-sighted and conditional love, how much more is an unfailing God able to unconditionally love and take care of us? Thank you to talented tattoo artist Katie Kroeker from Metamorphosis Body Art (Winnipeg, Canada) and photographer MacKenzie Jean. "I am not a place for cowards" is something I read once and it really resonated within me. "I am not a place for cowards. I am fully of opinions and convictions. I do not idly sit by. I am passionate and moody. My laughter bounces off the walls. I wear my insides on the outside. I am not a place for cowards." It's about being fierce and fiery, unapologetic about being yourself. Some people will love that about you and stick by your side for life. Those people are the people I want to be with. The people who can't handle through-thick-and-thin, all-in relationships are the ones that I'm just fine letting go of. I am not a place for cowards. Thank you to Natalie (also a photographer!) and tattoo artist Britta Christiansen (San Celemente, CA). Here's a lovely, simple story from Maggie. "It's really simple. I am saved by Grace and His Grace is Sufficient for me." For one of my favorite meditations on grace, I suggest David Richo's The Power of Grace: Recognizing Unexpected Gifts on Our Path. As we get older we face such unexpected challenges, especially around our health and the health of those we love. 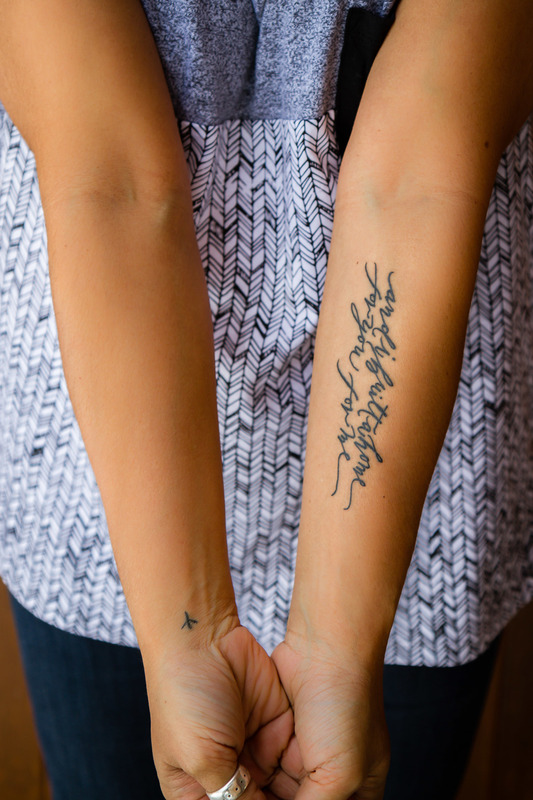 I am grateful to Shannon for sharing the inspiration behind her tattoo. These lyrics remind me of several truths. First, the idea that, no matter the circumstances surrounding us, we can turn to God for a lasting peace that runs far deeper than any momentary troubles. Second, when we believe that Jesus Christ is God's Son and that He paid the price for our sin so we can be with Him for eternity, our hope is no longer based on what does or doesn't happen during our days. Rather, we have an eternal hope that is firm and secure—unwavering no matter what sea billows may roll. I understand how it feels to have the storms of life overwhelm you, but I also know firsthand the joy and peace God brings when we trust in Him. My mom has Huntington's Disease, a devastating neurodegenerative condition, and was recently placed on hospice care, but I can say it is well with my soul. My grandpa has been fighting cancer, but still I know it is well. My sister just found out she, too, has cancer, and likely has a long battle ahead. But it is well. I, too, carry the gene for Huntington's Disease and could face a future similar to my mom's. Even so, it is well with my soul. Mara's design is a beautiful reminder of a truth that was already a part of me. Now that it's inscribed on my arm, I find myself looking at it often. I see it as I soak up what time we have left with my mom. I see it as I call my grandpa to talk about his treatments. I see it when I text my sister, asking if it's a good day or a bad one in her fight against cancer. And I see it when I think of what may lie ahead for me—knowing that God will be faithful no matter the pain that may come. Huntington's Disease might crush my body, but my future is secure with Christ in heaven. It IS well with my soul." Thank you to Shannon; to tattoo artist Monty Mavimol of the The Honorable Society (West Hollywood, CA); and to photographer Adie Gateley. Greetings, 2017! Sharing this tattoo story from Devin seemed appropriate for the start of the new year as we prepare for what is to come, come what may. "This is a quote from an Andrea Gibson poem. If you've never heard of her she's one of the most wonderful spoken word poets out there. Many of their poems have moved me during hard times of self-identity and coming to terms with who I am in many ways. Here's an excerpt from the end of 'Dive.'" Thank you to Devin for sharing his story; to tattoo artist Nina Dinh in Toronto; and to photographer Amber Patrick. 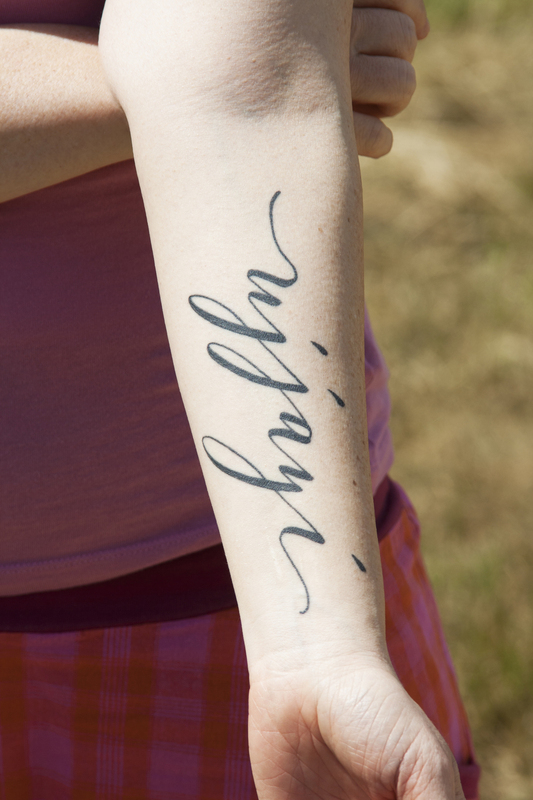 This tattoo represents many things to me, including my identity, my love story and…my children. The number three (trois, in French) has always been significant in my life, but only became evident to me when I met my husband. Suddenly, it was like the pieces of my own personal puzzle were finally coming together. Fast forward (three) years, and I was pregnant with twins. My body became a sanctuary for two human beings to grow and thrive in. Three of us, as one. While we no longer share my body, my beautiful children, Henry et Marie, will always be a part of me, until the day I die. They are my greatest gift. Thank you to Susan for sharing (you can read more on her blog), tattoo artist Mike Ski (Philadelphia, PA) , and photographer Ashley Ludaescher. Hello and happy fall! I was glad to receive this latest tattoo story from Crystal, who chose Dante's phrase, "A great flame follows a little spark." Mara's beautiful calligraphy was the best way to represent the elegance of Dante's work. To me this phrase serves as a gentle reminder and encouragement that essentially, small steps lead to bigger ones. Whether it's personal goals or anything else, the hardest part is just getting started and having the will not to give up on our dreams, because I believe that this life is the only one we are gifted with. Thank you to Crystal, and her tattoo artist Chris Wellard in Toronto. The inner arm has become the favorite location for of my tattoo commissions, but Sandra's definitely takes up the most real estate. I love the way it turned out. The size really captures the thick and thin lines. I'll let her tell you more about the significance. On that special day, after years and years searching for the perfect handwriting, the perfect word or text and the perfect placement, I found Mara, and I felt like: This is it. And finally, there came this one word to my mind, to be placed on my forearm. Every once in a while I'll be asked to calligraph song lyrics for tattoo clients. Nadya's story, and the choice behind this song, is so moving. There have been times my yoga teacher has played "To Build a Home" during savasana. And so the image of both me and Nadya, separated by thousands of miles, lying on the floor and listening to the same song (through speakers or in our heads) and processing it through our difference life experience made it all the more special. Close introspection usually comes when one choses a tattoo, something permanent that will resonate with you all your days. When I first heard the song, To Build A Home by The Cinematic Orchestra, it came drifting into my head as I was laying on the floor in Savasana at a yoga studio. I was moved by this beautifully haunting song and as it lingered in my head for days afterward, I realized I needed a closer listen. My husband had just been diagnosed with cancer and we were in the depths of hell. As our family learned to cope with this new world, the phrase from this song --"I built a home for you, for me" spoke to me. They seemed to be the words that represented me and my position in our lives. Our home was our cocoon away from the world -- and I provided the comfort & stability we needed to weather the storm. In our home lived hope and strength, positivity, love and most importantly, laughter. In the midst of treatment I would drive and listen to this song with the volume cranked. On the overwhelming days when the hurt was new and raw I would cry, but as time passed, tears turned to reflection and with it a kind of peace. It is a wonderfully poetic view of life. The very fact that we truly did build our home was a just a wonderful coincidence. Life is not fair, it just is. Things happen and how we react and cope with the events that shape our lives are what make us who we are. 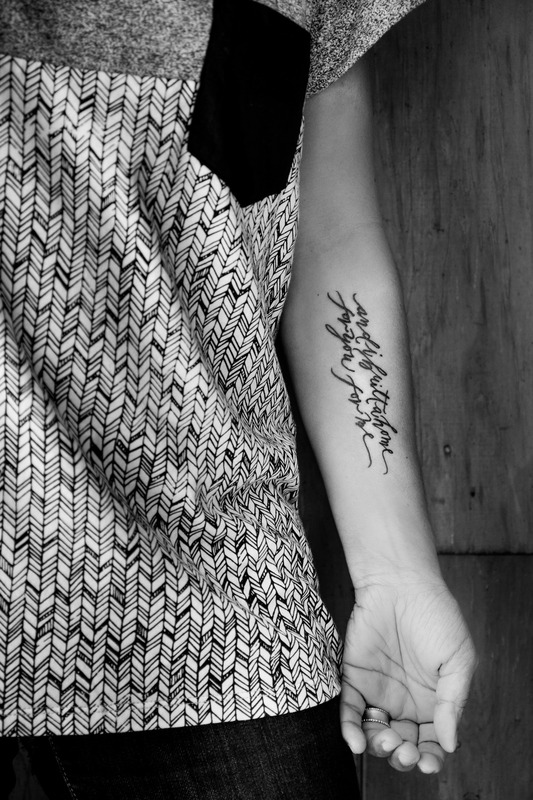 Of this I am constantly reminded, when I look down at this beautifully scripted affirmation on my arm. Thank you Patrick Watson for writing these powerful words, and thank you Mara for working with me to transform them into something uniquely me. Thanks to Nadya for sharing her story, to tattoo artist Jamie "Grazzhopper" Lindsey (Toronto), and to photographer Pete Nema. Here's the song should you care to take a listen and bawl your eyes out. What a pleasure it is to share Megan's story. 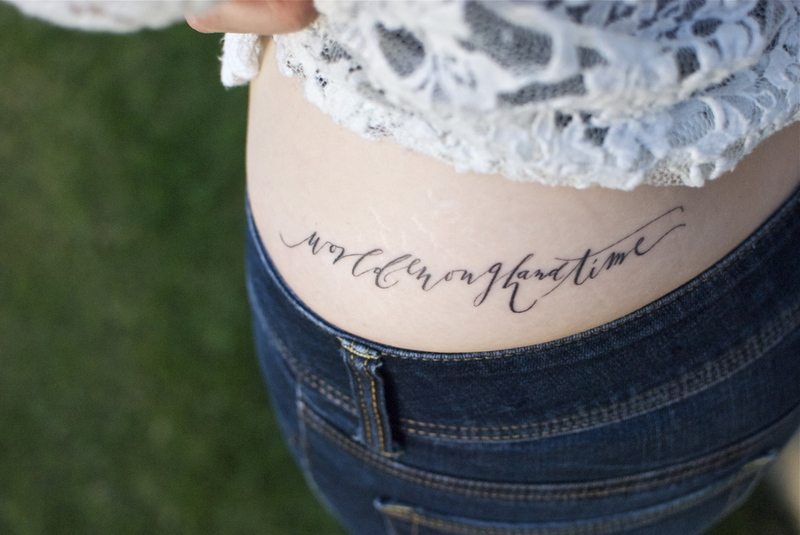 I'm always moved by tattoos that originate from literature and poetry. The idea of time racing past, myself powerless to stop it, has plagued me for a while. When my aunt passed away a couple of years ago, I couldn’t shake the feeling that I would never have enough time. On the other hand, I kept telling myself, that life has given me a wonderful gift: the world and time, if I am brave enough to embrace it. I love that this tattoo captures these two beliefs so perfectly. The first being that time will keep moving no matter what I do. That’s life. Then again, I’ve been given the most beautiful, glorious gift imaginable, the ability to see the world; and use the time I have here to love, go on adventures, seek new wonders, and experience all that this great world has to offer. Reading Megan's story brought to mind two references in my own life about this feeling of time passing. The first is INXS's Not Enough Time, a song that's been on repeat lately. And the second is a quote from Renaissance polymath Girolamo Cardano, as quoted in Nancy Siraisi's book: "The studious man should always have at hand a clock and a mirror. A clock since in such confusion and mass of things it is necessary for him to to keep track of time...; a mirror to observe the changing conditions of his body." A clock, a mirror, the world enough, and time. Thank you to Megan, photographer James Bean, and to tattoo artist Dr. Woo in Los Angeles.